What Does The Decentralized Web Need? In, among others, It Isn't About The Technology, Decentralized Web Summit2018: Quick Takes and Special Report on Decentralizing the Internet I've been skeptical at considerable length about the prospect of a decentralized Web. I would really like the decentralized Web to succeed, so I admit I'm biased, just pessimistic. Below the fold, I try to explain of each of them at more readable length. In the wake of Nintendo's recent lawsuits against other ROM distribution sites, major ROM repository EmuParadise has announced it will preemptively cease providing downloadable versions of copyrighted classic games. Below the fold, some comments on this threat to our cultural history. Filecoin needs to generate $25.7M/yr over and above what it pays the providers. But it can't charge the customers more than S3, or $0.276/GB/yr. If it didn't pay the providers anything it would need to be storing over 93PB right away to generate a 10% return. That's a lot of storage to expect providers to donate to the system. On my bike ride this morning I thought of another way of looking at FileCoin's optimistic economics. FileCoin won't be able, as S3 does, to claim 11 nines of durability and triple redundancy across data centers. So the real competition is S3's Reduced Redundancy Storage, which currently costs $23K/PB/month. Assuming that Amazon continues its historic 15%/year Kryder rate, storing a Petabyte in RRS for a decade is $1.48M. So, if you believe cryptocurrency "prices", FileCoin's "investors" pre-paid $257M for data storage at some undefined time in the future. They could instead have, starting now, stored 174PB in S3's RRS for 10 years. So FileCoin needs to store at least 174PB for 10 years before breaking even. It gets worse. S3 is by no means the low-cost provider in the storage market. If we assume that the competition is Backblaze's B2 service at $0.06/GB/yr and that their Kryder rate is zero, FileCoin would need to store 428PB for 10 years before breaking even. Nearly half an Exabyte for a decade! At last I started clearing out the garage laundry room cupboards, which is where amongst much other stuff the optical media backups I take every week have been accumulating for many years. They have been stored in a fairly warm shirt-sleeve environment with no special precautions. So to get some idea of the durability of writable optical media, I've been somewhat randomly pulling groups of backups out of the stacks and re-verifying the MD5 checksums, which were all verified immediately after writing. TL;DR: Surprisingly, I'm getting good data from CD-Rs more than 14 years old, and from DVD-Rs nearly 12 years old. Your mileage may vary. Below the fold, my results. Introducing the Internet of Torts, in which she describes "how IoT devices empower companies at the expense of consumers and how extant law shields industry from liability." Accountability for the Internet of Torts, in which she discusses "how new products liability law and fiduciary duties could be used to rectify this new power imbalance and ensure that IoT companies are held accountable for the harms they foreseeably cause. Below the fold,some commentary on both. much of the innovation in blockchain technology has been aimed at wresting power from centralised authorities or monopolies. Unfortunately, the blockchain community’s utopian vision of a decentralised world is not without substantial costs. 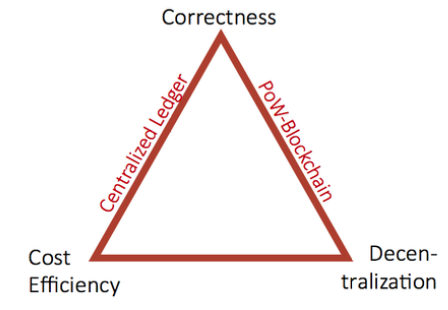 In recent research, we point out a ‘blockchain trilemma’ – it is impossible for any ledger to fully satisfy the three properties shown in Figure 1 simultaneously (Abadi and Brunnermeier 2018). In particular, decentralisation has three main costs: waste of resources, scalability problems, and network externality inefficiencies. Below the fold, some commentary. Last week I attended the main two days of the 2018 Decentralized Web Summit put on by the Internet Archive at the San Francisco Mint. I had many good conversations with interesting people, but it didn't change the overall view I've written about in the past. There were a lot of parallel sessions, so I only got a partial view, and the acoustics of the Mint are TERRIBLE for someone my age, so I may have missed parts even of the sessions I was in. Below the fold, some initial reactions. Can I compile and run a node? What happens when you close half of the Lightning Network? Brekken's final TL;DR was “Operating the largest node on the Bitcoin Lightning Network has been educational, frustrating, fun, and at times terrifying. I look forward to trying it again once the technology matures.” Below the fold I look into some of the details.